Drrrrrrrama! It’s only Week 2 of the One Room Challenge and I’m already stumbling. We went to order the BED and discovered it is out of stock and won’t arrive in time for the project deadline. I’m freaking out. We literally designed my client’s bedroom around this bed. ALSO, two of the tiles we sourced for the bathroom are back-ordered and the bathtub arrived cracked. I’m trying to maintain my cool, but it’s a lot to juggle (in addition to all of our other projects, of course!). But before we get too far ahead of ourselves, let’s start where we always begin our design projects: with the Floor Plans. As you’ll remember from last week’s post, one of the challenges in this room is the bay window. With the other walls being obstructed by (6!) doors in the room, the space in front of this window is really the best place for the bed. 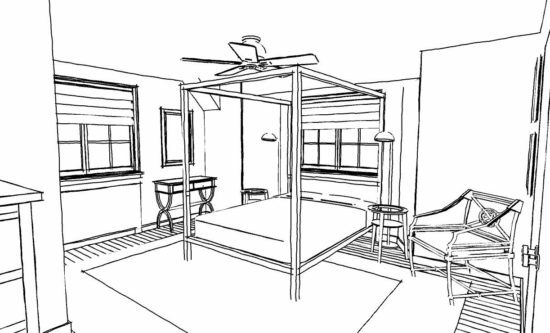 I decided to embrace the bay location and proposed a modern canopy bed that would command the room while still feeling airy and clean. 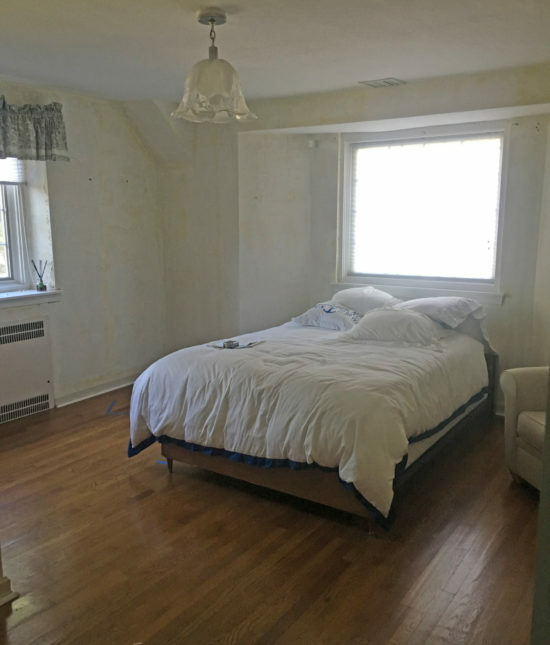 We plan to flank the bed with round tables that will nestle nicely into the bay, and we will finish off with floor lamps behind the tables to leave space for personal items on the tabletops. This is our inspiration board for the bedroom. We’re calling it “Preppy Bohemian with a British Colonial influence.” That’s a thing, right? 😉 I wanted to start with a classic base in this room with a blue & white theme, which are colors we’ve already used consistently throughout the home. I love the idea of enveloping the entire room (including some of those awkward doors) in a wallpaper. A striped paper feels very traditional – maybe even a little masculine – and it creates a foundation that we can then layer British Colonial, Bohemian, and eclectic influences onto. I’m also inspired by the idea of warm wood tones and natural materials like jute to balance out the saturation. In the bathroom, we were able to get a little dirty and knock down some walls. Figuratively, of course, because you don’t want me literally doing your demo! 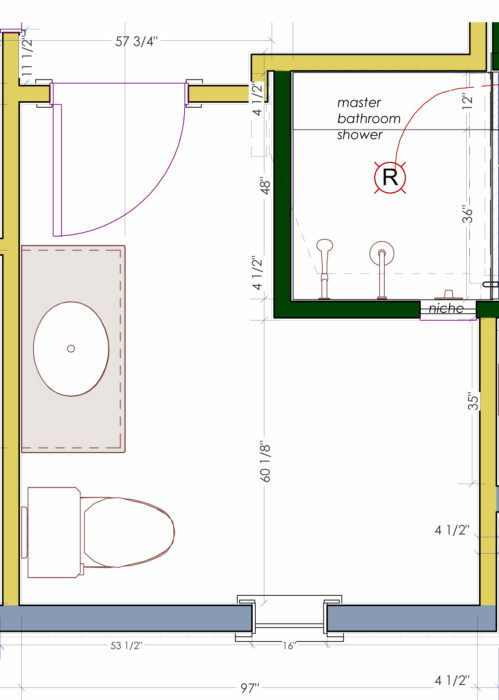 But I’ve planned for a relocation of the bathroom door, and it will greatly enhance the floor plan in this small space. 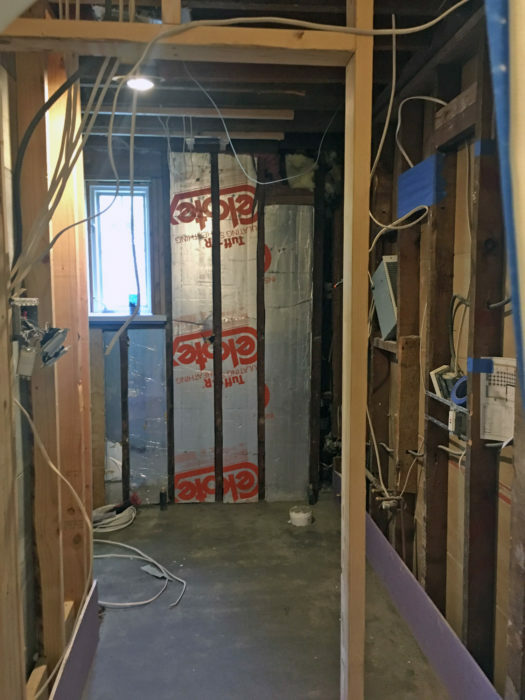 After a little investigation, our General Contractor confirmed that we could move the doorway leading into the bathroom, allowing us room to do a fantastic double vanity – yay! Due to depth constraints of the available vanity space we decided it would be best to go custom, which will allow us to do a 19” depth. Beyond that, we’re putting a tub and shower into the previously abandoned alcove, and finishing with a new toilet. 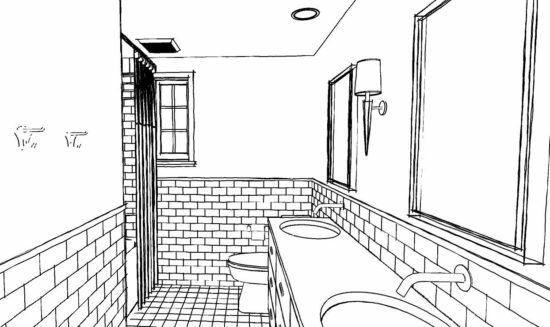 We’ll continue the preppy bohemian theme into the bathroom. This time we are skipping the blue and keeping it more neutral, While the colors will the the calming tones of whites and grays, we won’t shy away from pattern! 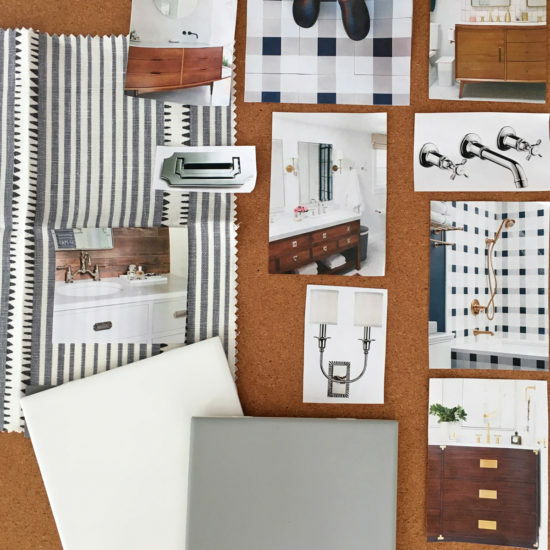 We loved the concept of a plaid tile and I can’t wait to see it incorporated into this space. Our other favorite element is a campaign-inspired walnut vanity. This custom piece will create warmth in the room, and will tie into the natural wood in the bedroom as well. We plan to keep the rest of the room white and bright, and add a funky shower curtain to bring an eclectic touch to the space. Meanwhile, the bathroom has been stripped to its studs and the electricians and plumbers have run their new wiring and drain lines. Buono Construction wasted no time moving the door to allow space for the vanity. 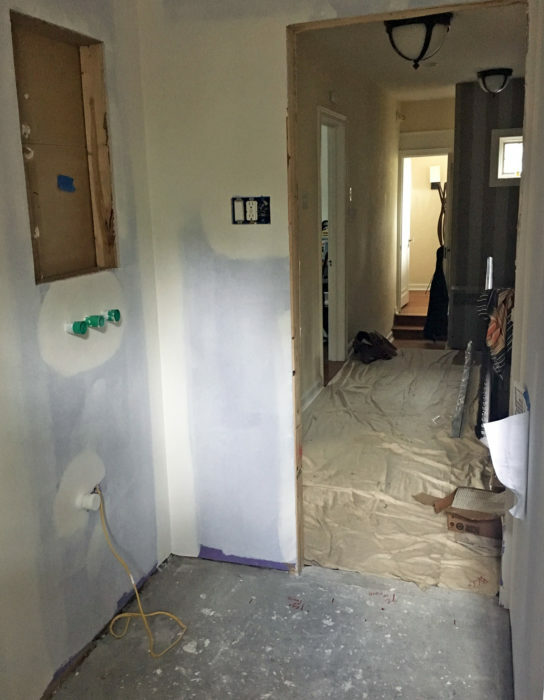 Amazingly, the permits came through at the end of last week, and we were able to proceed with drywall. Here is a view of the relocated door from inside the bath. You can see one of the future medicine cabinets and the roughed in pipes for the wall-mount faucets. We’re making great progress but there are still SO MANY variables up in the air. While many items (like the stupid bed!) are still in limbo, many materials are beginning to arrive to our office and jobsite. I’ve been spoiling my own challenge reveal by sharing some of the products on our Instagram stories. Just can’t help myself… I LOVE everything we’ve chosen. 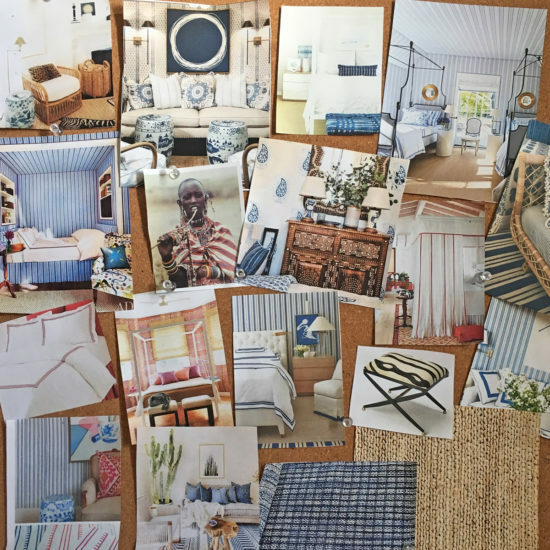 Naomi can you share the source of the gray and white striped fabric on the bathroom mood board? Always love your designs, my favorite design blog and design work by far! Well, you had me at the blue and white preppy bohemian nee brit colonial. Totally a thing. As with all your projects, I am sure you will deliver HUGE in the end despite the back orders. Can’t wait to see! Umm absolutely loving the name of the room: Preppy Boho w/ British Colonial. Speaks to my heart, and my schizophrenic design mind. Preppy + Boho + British. 🙂 Cant wait to see your room!! Thanks! 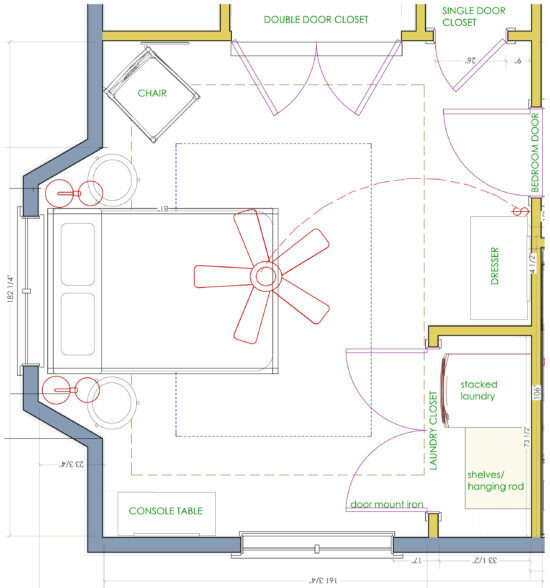 We use a CAD program called Chief Architect for both the floor plans and renderings. Can’t wait to see I’m sure it will be stunning! 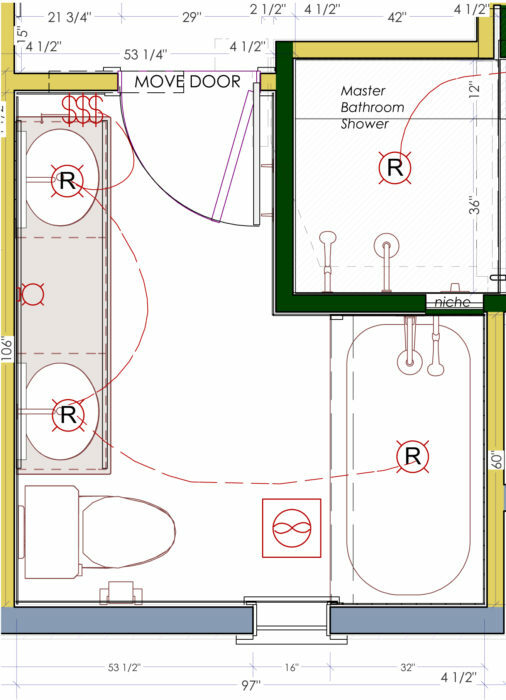 Thanks for including the floor plans and elevations. It really helps to get a sense of the plan. How smart to move the bathroom door. A small change with a big impact. Love the inspiration boards, too, and look forward to seeing how it all comes together. sorry to hear about the bed, but knowing you, I know you’ll figure out a way to make this project work, and work GREAT!